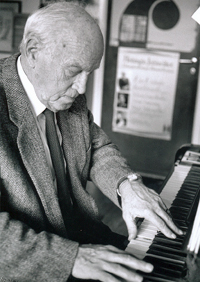 Finnish composer, pianist, composition teacher and music critic Einar Englund was born in Ljugam on June 17th, 1916, and studied with Bengt Carlson at the Sibelius Academy in Helsinki. On a recommendation from Sibelius, possibly on the basis of his piano quintet, he continued his studies with Aaron Copland at Tanglewood. He fought in World War II, an experience which inspired at least some of his earlier works. Gaining tumultous acclaim for his first two symphonies, Englund rose to prominence in the period immediately following World War II, where his music's resemblance to the works of Shostokovich and Prokofiev attracted the attention of music lovers and critics alike. A composer who didn't belong to any modern school or trend, he over the years continued to enrich and refine his distinctive personal style. Englund died in Ljugam on June 27th, 1999. Ondine recorded the complete symphonies, as well as the piano concertos and the cello concerto, in addition to the incidental music The Great Wall of China.